What Is Va Form 21p-8416 Series? The VA 21P-8416 forms series is a set of two forms published by the Department of Veterans Affairs (VA) and used by claimants to report various medical, legal and other expenses. These forms are used to provide the VA with information that will be necessary to determine the eligibility for the VA benefits and the payable rate. 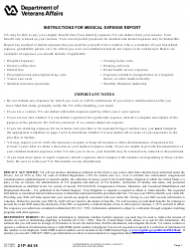 VA Form 21P-8146b, Report of Medical, Legal, and Other Expenses Incident to Recovery for Injury or Death. Submitting medical and other expenses may reduce countable annual income and facilitate the process of filing a claim. The VA might require medical expenses reports in three possible situations: at the initial application stage, annually at the end of the year and when a significant change in medical expenses occurs. It is advised to maintain records of all medical expenses for the past three years at least, in case the claimant is ever called upon to substantiate those expenses. The VA might request them for verification of the submitted information. VA Form 21P-8416 is used to report only medical and dental expenses that a veteran does not expect to be reimbursed for. These expenses might be paid to the veteran or a member of their family. Expenses that can be reported using this form might include any of the following: hospital expenses, doctor's office fees, dental fees, prescription/non-prescription drug costs, vision care costs, medical insurance premiums, nursing home costs, hearing aid costs, home health service expenses, and monthly Medicare deduction. 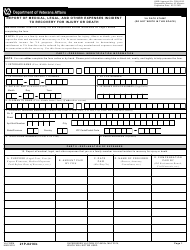 In addition, this form can be used to claim expenses related to transportation to medical facilities. VA Form 21P-8416 is used to claim expenses paid for recovery. These expenses may be paid by the veteran or their family member. This form is used to claim only medical expenses related to injury or death, as well as legal and other payments for recovery. Both forms should be filled out either online or manually. The claims can be filed online through the VA website. 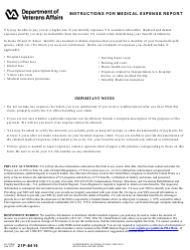 Alternatively, the forms can be filled out and mailed or presented in person at a local VA office.